More than 300 invited guests and residents attended the VIP Preview for the long awaited Oakmont Residence Club. The weather cooperated and provided a fabulous backdrop for the club’s first outing. Located at the end of Oakmont’s tree-lined main boulevard, the imposing colonial-style façade warmly welcomes its visitors, weighing in at 6,000 square feet at a cost of just over six million dollars. The finishes and architectural appointments are impressive. A large archway from front to back flanks a grand gathering salon and a fitness center, leading you to the lavish pool pavilion. Complete with top-notch lanes pool, large swimming pool and a fun zero-entry splash pool for the kids, this complex is sure to please all comers. 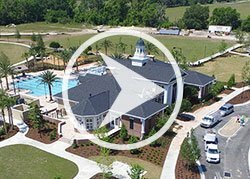 Beyond the pools, a large elliptical event lawn and children’s playground round out the “backyard.” Just off the east veranda of the clubhouse, four screened tennis courts and a basketball court complete the club’s offering. The resident’s club will officially open on Friday, May 27th. An exclusive reception for the residents is planned from 5:00pm-7:30pm.